On my first few shaky turns around the rink, my front shins ached and I tensed as though I’d never skated before. A few skates later, I found myself back in a familiar pattern. My left skate was solid and stable on the ice. By the third skate I could come onto my outside edge and stay there, one skate on the ice, for as long as I wanted. My right skate wobbled. The outside edge was hard to find and harder to keep. And though it improved every time I skated, it never felt as stable as the left leg. Amazing. Forty years later , I have the same left/right imbalance as I did when I hung up my skates. Even more amazing, after 23 years of yoga, I know what to do about it. 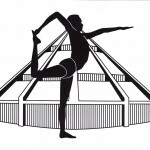 This is, after all, the same problem that presents itself in every standing balance pose. I shouldn’t have been surprised. Figure skating draws heavily on dance, and dance shares a common movement vocabulary with yoga. Anyone who watched figure skating during the Olympics had lots of chances to play “name that asana,” but the connections go deeper. To firm the standing leg on my looser right side, I need to pull the head of the thighbone deeper into the hip joint. This creates an automatic lift of the core, but the results are even better if I also lift my pelvic floor. On ice, pulling my thighbone in is magic. My right blade steadies underneath me. And lifting the pelvic floor creates more room for the ball of the thighbone to snug into the hip socket. 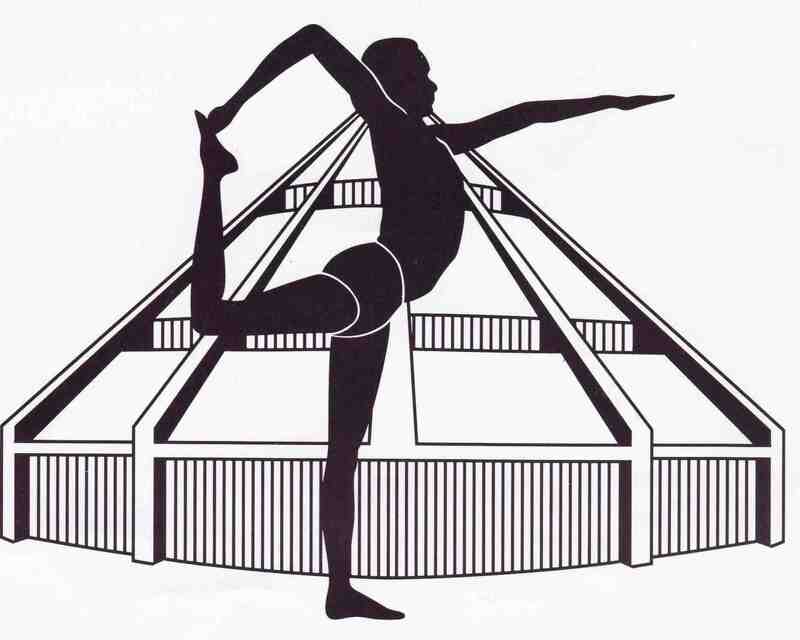 On my yoga mat, the effect of skating, even once a week, is more stability in my right hip in poses such as warrior III (Virabhadrasana III). Any time you stand on one leg, skates or no skates, the same action with your thighbone will make you more stable and improve your balance. One way to feel this action is to stand in Tadasana with a yoga brick between your thighs. Place the brick with its narrow side facing forward, as high between your thighs as you can manage. Then walk your feet as close together as you can. First, grip the brick with your inner thighs, then release it. Then squeeze the block from your outer thighs, moving the ball of your thighbone deeper into your hip socket. If you have the correct motion, the muscle you’ll feel contracting is gluteus medius, which connects the top of your thighbone to your pelvis. But it’s a subtle motion. And if your gluteus medius is underdeveloped or simple hard to access, your more superficial buttock muscles, gluteus maximus, can take over. If it does, you’ll feel the block moving forward. Try this: keep the block in place and shift your awareness to your feet. Press your heels down strongly. Without actually moving your heels on the floor, pull them towards each other. You should feel a sensation moving up your outer legs to the hollow of your hips. Hold this position long enough to feel strong work in the hollow of your hips. Once you know how it feels, you’ll find it easier to recreate this action. Athletes all over the world use yoga to help them excel at their sport. Happily, the exchange goes both ways. Have you felt the interplay between your practice and your movement when you’re playing a sport, running, cycling, swimming? My other sports are rock climbing in the summer and downhill skiing in the winter. One thing a long term regular yoga practice brings to those sports for me is the “staying in shape” between seasons! Before I had a yoga practice, the beginning of each season found me back at square one, even though the previous season I had gotten to a certain point at seasons end but by the next summer climbing or the first snowfall in winter I had lost all my gains. However now its just not so and it all comes from my yoga!! One day skiing I spent the morning focussing on the skin on the bottom of my feet, just as I might do during a practice. What an improvement in my ski day. Another time climbing I focussed only on my mid line and my breath, wow what a day that was! Not to mention the delicious-ness of going to my mat at the end of the day after skiing or climbing, the lovely softening and gentle lengthening of my muscles that worked so hard all day for me. Ann, what a fabulous description of taking your practice into skiing and climbing, and then soothing your body at the end of the day! 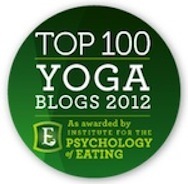 It’s great to hear from you, and lovely to read such a conscious account of the way your yoga feeds your other sports. Intriguing post. I, too, find a happy symbiosis between yoga and sports. Besides actual muscular parallels, I find that yoga has heightened my existing desire for symmetry. When I learned to do the flip turn in freestyle swimming (or my variation, anyway), I felt compelled to try turning with either arm extended–even if my swim instructor said that most swimmers use just one side. Correction: Tara Lipinsky is American! At age 15 she “stole” the gold from my pick, Michelle Kwan, in 1998. Yikes Yoga Spy! Thanks for the correction. I’ll fix it ASAP. I feel the same way about flip turns in swimming – either arm ought to work just as well. But I’m so likely to take on water on a flip turn that I don’t generally try the second arm.